Don’t you love the start of a new school year? The kids and I started school about a month ago. We finished our last school year early, which worked out well since my mom was so sick. With everything that has happened, I thought it’d be nice to get back to a predictable routine earlier than the “regular” school year. The kids do well with it, and I’ve found that it is always nice to have a little extra time built in to our school year, just in case a big life event happens. I really pray that this year will be mellow, though. I think we’re overdue. As most of you know, we’ve used Ambleside Online for most of our homeschooling adventure. I really love Ambleside, and it has been so great for us. This year I decided that I really wanted to just order a curriculum and not have to put things together. That sounds kind of lazy when I type it out, but life has just been so complicated and I wanted everything to come in a nice, neat package. I’ve also been wanting to cover American history, because we’ve done a lot of ancients and world history in the past few years. I decided to order Sonlight Core D (5-day with the Advanced Readers). I actually bought a used, full set, rather than buying new, although I bought my 4-year-old’s core directly from Sonlight — more on that later. Anyways, the woman that I bought the Core D from even packaged it in the original Sonlight box, and the books were in amazing condition. Hooray for a good ebay score! Other than that, we’re just plugging along. For those who don’t know, we use Singapore Math for both big kids, and have from the beginning. I went ahead and ordered some of the Life of Fred books for them as well, because they read the samples and thought they were hilarious. We’ve also used Handwriting Without Tears from the beginning, and we’re continuing on with that. I must admit that I’m really pleased with the way that the kids’ handwriting has developed, and I think my son’s cursive is probably better than mine, LOL. 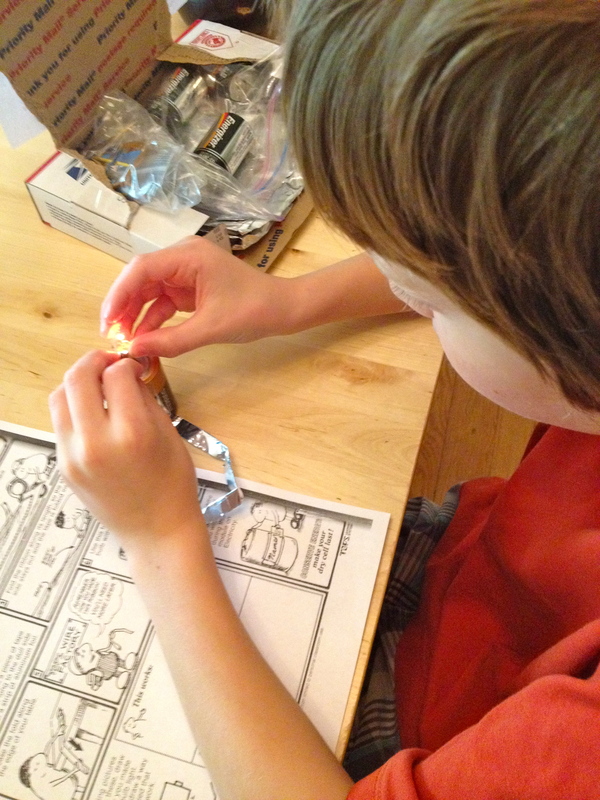 For Science, my daughter is doing Sonlight Science D and my son is doing Science E. The picture at the top of this post is my son doing one of the experiments from Science E, where he made his own wires and created circuits. Again, I was able to score the Science E on ebay, although I bought the Science D new. The books that come with both science cores are great. We were surprised by how much we loved the first book in Science E — Diary of an Early American Boy. It was fascinating. I learned so many things while reading it! My 4yo is right on the cusp of the Kindergarten cutoff here. Our district has a fairly late cutoff. Last year it was December 1st. This year it is November 1st. She has an October birthday, so she’d be a Kindergartener here if she went to school in our district, but she might not make the cutoff date if we sent her to a charter school or a school in another district. Taking all of that into consideration, we decided to let her start working through My Father’s World K, which my now-8yo loved so much when she was 4 that she asked if she could do it again with her little sister, LOL. The phonics part is good, but their literature is kind of “meh”, so we are also doing Sonlight P4/5 with her for everything else. My older kids have really enjoyed all of the fairy tales, fables and world stories in the P4/5 books, so that’s been fun. My 8yo has read a few of the anthologies in there 2 or 3 times on her own in the past few weeks. My 4yo and 2yo think the stories are the funniest things ever. They’ve been retelling them and laughing hysterically every time. Awesome. That’s one sign of a good day of Kindergarten. We’re using Teach a Child to Read with Children’s Books once again, because it has been a wonderful method for teaching reading to all of my kids. My 4yo is so proud of the books that she is reading, and my 2yo has even gotten in on the action and read a few of them. So cute. Check out my review of this book from back in 2007, if you’re interested. We’re using Singapore math as well but I may switch to Beast Academy in the spring for the eldest. I’ve heard a lot of great things about it but I like Singapore especially the Intensive Practice so I’m not certain yet. The eldest is also doing Story of the World 2, Writing With Ease, some random geography workbook he loves but I think is just busywork, All About Spelling,logic, and American history through books I find at the library. He does science almost entirely on his own as well although I wish I was organized enough to teach it. I think we’re going to try Latin again this year. Wow. That looks like a lot when I write it out but it doesn’t take that much time. The five year old is doing Singapore kindergarten, Handwriting Without Tears, and All About Reading. She’s my non academic child so this is pretty much it. I think she might grow up to be a dancer.